The Indian Pond Heron (Ardeola grayii) is a common heron that is found breeding in the Indian subcontinent ranging to Iran. Its alternate name is paddybird, which is derived probably from its preferred habitat, marshy wetlands or in cases where these have been cultivated by human, paddy fields. In the official checklist of the Nature Society (Singapore) Bird Group, there are two species of pond herons found in Singapore. The more common Chinese Pond Heron (Ardeola bacchus) and the rarer Javan Pond Heron (Ardeola speciosa) both which are closely related to the Indian Pond Heron. In fact, in non-breeding season, all three pond herons are indistinguishable from each other. It is only when they change into their breeding plumage that each of these species are easily separated visually. However this changeover into breeding plumage also signal their return to their breeding grounds away from Singapore. So there is only a small window in the season when they are around for us to ascertain their identity locally. In the case of the Indian Pond Heron, there have only been two prior records of their sightings in Singapore, one in Senoko and another in Pasir Ris Farmway 1. For some reasons, these sightings have not resulted in the Indian Pond Heron being included in the checklist yet. So it came as a shock to me that I recognise this bird species while perusing through my friend Er Bong Siong’s pictures taken at Bidadari on 17 April 2015. As it was late in the evening when I first came upon them, I only managed to go to Bidadari the next morning after running some family errands. By that time, there was a already a group of avid birders and photographers searching for the bird and they managed to locate it before my arrival. I managed to see the bird first resting on a tree, and subsequently perched on a bare branch before coming down to hunt for food on a grass patch below. Unfortunately it only stayed around until the early afternoon. The noise from tree cutting nearby and the presence of more people probably resulted in its early departure. All in all, I managed to get some pretty clear photos and video of the pond heron. Hopefully this sighting and the previous ones will result in the acceptance of this species into our checklist. My opinion is that although rarer than the other two species of pond herons, part of the reason for the lack of records is due to the fact that most people overlook this species. The non-breeding and breeding plumages of these three ponds herons are confusing unless a birder knows what field marks to look out for. Lastly, I just want to note that Bidadari, a place slated for development soon seems to continue to surprise everyone with the constant appearances of locally rare migrant bird species, underlining once again its importance as a stopover/refuelling point for many bird species in this region. This entry was posted in Birds, Wildlife and tagged Bidadari, Indian Pond Heron on April 23, 2015 by Francis Yap. The Short-tailed Babbler (Malacocincla malaccensis) is one of the resident ground babblers (Family Pellorneidae) in Thailand, Peninsula Malaysia including Singapore, Sumatra and Borneo. As the description implies, it tends to stay on the ground or perched very low in the undergrowth of the forest. In Singapore, is found in the Central Catchment Nature Reserve and Bukit Timah Nature Reserve, and its plaintive call is often part of the dawn chorus in these places. More often heard than seen, it is not exactly very skulky, but it’s most active before 9am. If one were to trek through Rifle Range Link in the early mornings, there is a good chance of encountering this bird either by the side of the trail or even in the middle of the trail if there is no one else around. Its tall leg is suited for hopping on the ground, and when it tries to perch on vertical stalks of plants, it has a rather distinctive gait. While still common in Singapore, it is listed as a Near Threatened species elsewhere. Even in Singapore, habitat fragmentation and low genetic diversity are of great concern as the long-term viability of this species locally is questionable. In fact we have in the recent years lost the population in Singapore Botanic Gardens. More needs to be done to conserve this and other forest species before time runs out. Please view the Youtube video below for a presentation of the topic. Another view. This babbler is often found below eye level. In this case, below knee level. A Short-tailed Babbler at Treetop Walk trail. Ringed by NParks. Perched distinctively on a vertical stalk. A Short-tailed Babbler on a dead tree stump found at Rifle Range Link. This entry was posted in Birds, Wildlife and tagged Central Catchment Forest Reserve, Short-tailed Babbler on April 22, 2015 by Francis Yap. 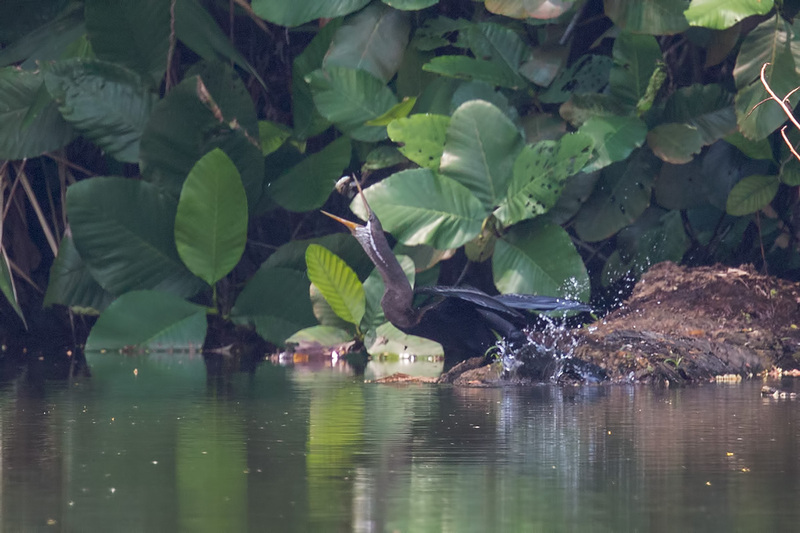 The Oriental Darter (Anhinga melanogaster) is a waterbird that is found in South-east Asia and South Asia. Historically they were breeding residents in Peninsular Malaysia (which include Singapore), but have vanished from this region save for some vagrant records. Recent records in Peninsular Malaysia include birds at Kinta Nature Park in Perak and Batu Kawan in Penang, which gives hope of possible reestablishment of this species in the region. So when a darter-like bird was reported in Singapore, it was time to it check out. 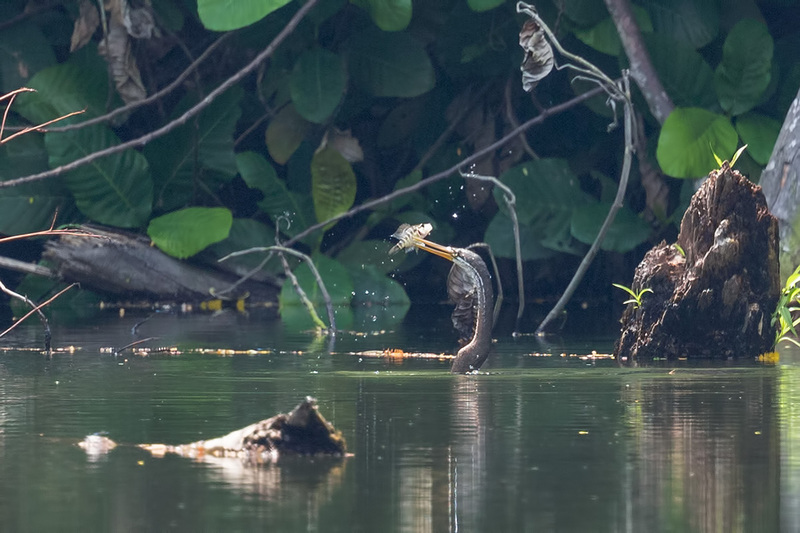 This darter was first reported in early August 2014 by Jean-Marc Chavette at a disused quarry at Bukit Gombak. The bird was rather shy and often flew in to the trees upon seeing human presence. Occasionally it will come out and sun and preen itself at the far end of the pool, unreachable by anyone. I managed to get some close shots of the bird through the longest possible focal length (500mm lens with 2X teleconverter and 1.6X crop camera, effective focal length of 1600mm), and they revealed that the bird was un-ringed and the feather condition was rather pristine. Coupled with its wary behaviour, it does suggest a bird that was wild or at least not recently kept. Once in a while it will swim around the pool at the far end, and hunt for fish. I managed to get a few shots of a successful hunt. Checking with AVA, Jurong Bird Park and the Zoo revealed that there were no imports of darter to the country. There had been a previous sighting of a flying darter at Neo Tiew Lane 2. In the end, the Bird Group’s record committee was undecided on the status of this particular darter. 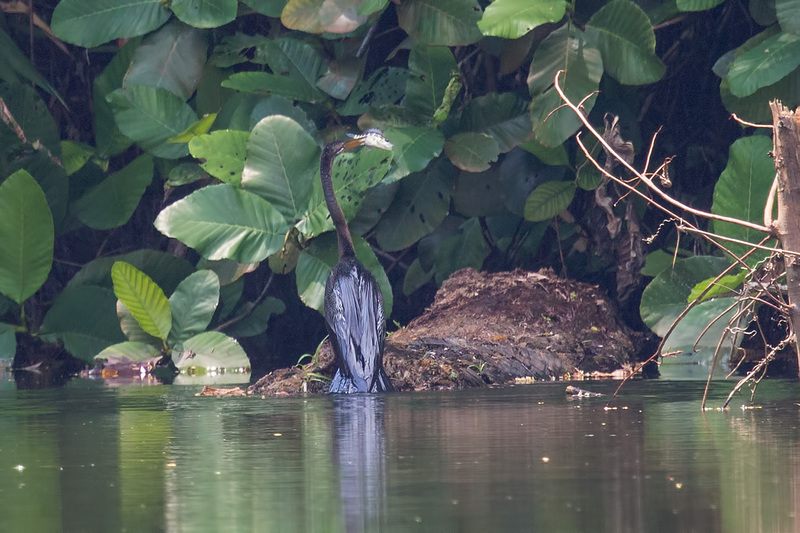 Recently, there were a couple of reports of a pair of darters in the quarries at Pulau Ubin. It will be interesting to follow up on those sightings, to ascertain their status. This entry was posted in Birds, Wildlife and tagged Bukit Gombak, Oriental Darter on April 14, 2015 by Francis Yap. The Black-headed Bulbul (Pycnonotus atriceps) is a species of South-east Asian bulbul that is considered a rare resident bulbul species in the forest of Singapore. They have never been seen in large numbers, yet have persisted over the years. Currently, the main flock is restricted to the Central Catchment Nature Reserves as well as the adjacent Bukit Brown cemetery area. There have been a single sighting at Pasir Ris Park recently, although their origin from the bird trade cannot be ruled out, as previous presumed escapees were found in Pulau Ubin, Sungei Buloh and Botanic Gardens (Lim KS 2009). Having said that, (Wells 2007) reported that they may have wandering behaviour. 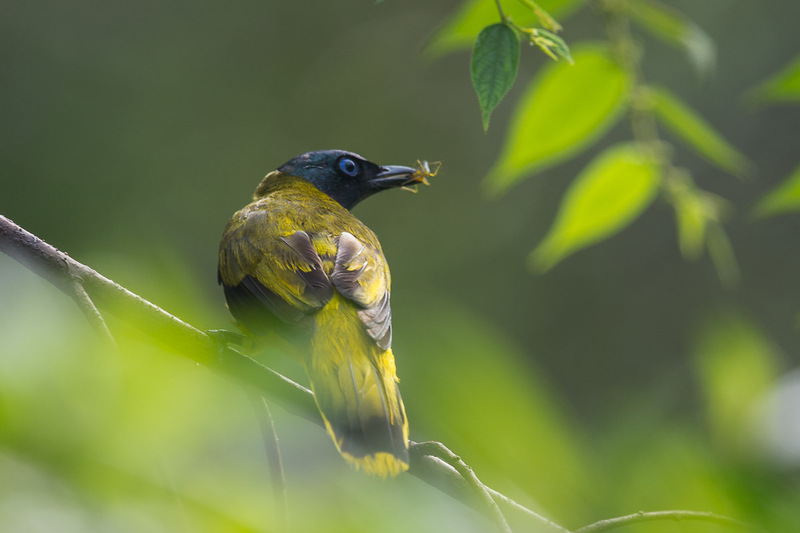 There is however one place at Bukit Brown that the bulbuls have been regularly seen, Bukit Brown. A particular fig tree there had regularly attracted the bulbuls when the fruits are in season. I had the opportunity to observe a small flock of 3-4 birds eating the figs. They hungrily devour these figs whole and picked only the reddest, most ripe ones. Another encounter was a single bird at the Macritchie boardwalk where it was observed hunting repeatedly for food among the tall grass that grew at the bank of the reservoir. Upon closer inspection, it was discovered that it was hunting for spiders. At least a pair were reported there for extended period of time. The hunting for and carrying away nutrient-dense spiders suggest that there was breeding nearby but we could not locate the nest. Little is known on the breeding habits locally, due to the scarcity of records. The Black-headed Bulbul is considered nationally threatened and they are seldom seen by anyone in Singapore, other than the committed birder. However we believe that with more eyes and better identification, we can track them better and get a more accurate distribution map and count. This will be a first step in conserving this species locally. A Black-headed Bulbul at Bukit Brown. A Black-headed Bulbul on a fig tree feasting on ripened figs. Taken at Bukit Brown on 8 October 2011. A Black-headed Bulbul perching on a tree brach at Macritchie Reservoir. A Black-headed Bulbul with a recently caught spider that it carried away soon after. This entry was posted in Birds, Wildlife and tagged Bukit Brown, Macritchie Reservoir on April 11, 2015 by Francis Yap. The Violet Cuckoo (Chrysococcyx xanthorhynchus) is one of the rarer resident cuckoos in Singapore. It is more often heard rather than seen. And when it is seen and identified, it is mostly flying away! One of the lessons I have learned along the way in finding this cuckoo is to learn its call. It is been described as a loud, spaced and repeated “ter-weet’ That is normally heard while it is flying around or on top of canopy of tall trees. The Violet Cuckoo is named after the appearance of the adult male bird, which has an attractive glossy violet feathers on the head and upper parts of the body. The degree of violet depends very much on the angle of light and can appear very dark. Interestingly the scientific name xanthorhynchus actually means ‘yellow-billed’ which is also a characteristic of the adult male. The female and the juvenile differs markedly from the male with the female having a dark, brown crown and greenish-bronze upperparts. The juvenile has a rufous crown and barred rufous and greenish bronze upperparts. Recent sightings in Singapore of this cuckoo include areas such as Pasir Ris Park, Bukit Brown, Dairy Farm Nature Park, Kent Ridge Park, Hindhede Park, Jelutong Tower, Neo Tiew Lane 2, Bukit Timah and Jurong Eco Garden. In fact the last place, Jurong Eco Park was where a male Violet Cuckoo was seen regularly for close to 3 months between end October 2014 to January 2015. The reason it was there was because of the abundance of caterpillars, which is one of its main diet. This regular appearance was a boon to bird photographers who managed to record many photos of the bird. The previous extended display of this bird was in January 2011 at Pasir Ris Park where one bird was seen daily feeding on caterpillars. This is one of the peculiar thing about this species of cuckoo. For the better part of the year, they are hard to find, but once there is a suitable and sustainable food source, they appear regularly until the food source is depleted. There is speculation that some of the birds recorded in the winter months are in fact migratory birds. This however is hard to prove. Nonetheless the dates of appearance of these two adult male birds seen for prolonged period of time are within the wintering months. Although many pictures and videos have been posted on this species, there is still much to learn about it’s behaviour. For example, it is known that like many cuckoos, it is a brood parasite that lays its egg on the nest of another species. In Singapore, there are past reports of hosts including the Brown-throated Sunbird, the Van Hasselt’s Sunbird and the Olive-backed Sunbird. Pictures and videos of these species interaction will be valuable indeed. The male Violet Cuckoo showing well it’s back. Taken at Jurong Eco Garden. Notice the leaves that have been eaten by the caterpillars. A male Violet Cuckoo with a caterpillar. A front side view of the male Violet Cuckoo. A side view of the male Violet Cuckoo. A young female Violet Cuckoo. The crown is brownish. This was taken at Neo Tiew Lane 2. Another view of the young female Violet Cuckoo. It’s appearance stands in contrast to the more striking adult male. The secondary call of the Violet Cuckoo is less known. I made a recording of this call on 28 October 2014 at Jurong Eco Garden. This entry was posted in Birds, Wildlife and tagged Calls, Violet Cuckoo on April 5, 2015 by Francis Yap. Is there a Singapore Scops Owl?